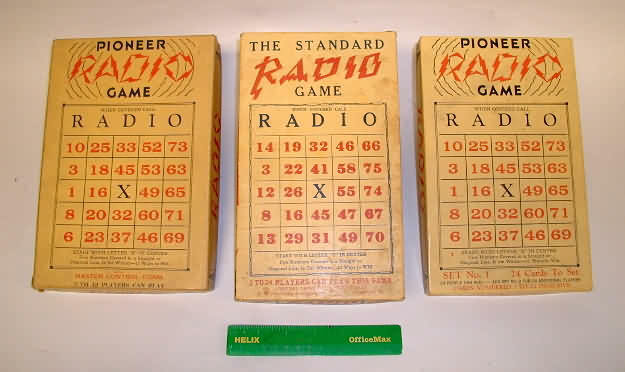 RADIO GAMES: More variations of the Bingo type game using the word RADIO. All are about 6 x 10 inches high and are in very good condition. RADIO GAMES: More variations of the Bingo type game using the word RADIO. All are about 6 x 10 inches high and are in average good condition. BIG LITTLE BOOKS: Published in the 1930's these little books are radio related titles. Left is vgd, center good-, right good condition. RADIO NOVELTIES: Avon bottle shaped like cathedral radio, 2nd -same in original box; ceramic cathedral (hangs); Keepsake Christmas ornament 1993 (makes sound and lights). 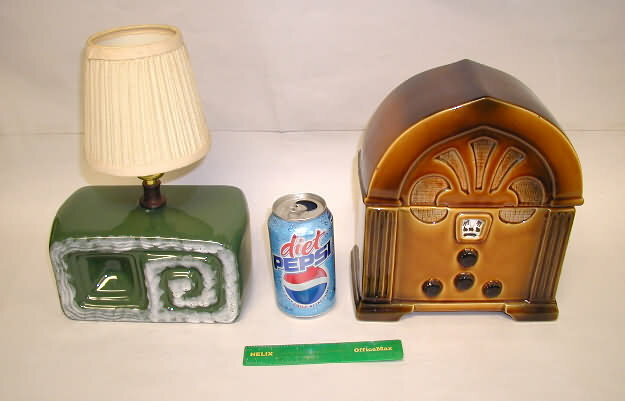 RADIO NOVELTIES: Radio shaped table lamp (not wired), 8 inches wide. A cathedral shaped cookie jar, 8 5/8W x 10 inches high. CIGARETTE DISPENSERS: These console radios are metal cigarette dispensers made in 1929. They came in 4 colors. First two have replacement feet; 3rd may have been repainted in past(? ); 4th is in vg- original condition. 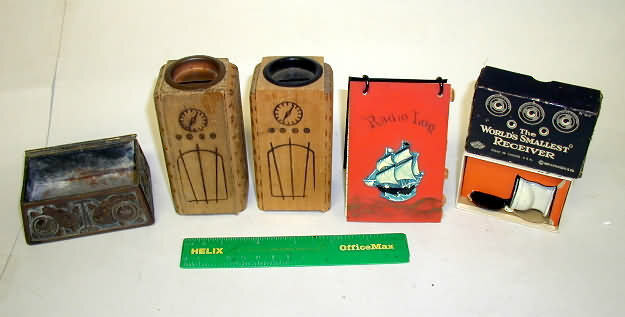 RADIO NOVELTIES: Left is a cast bronze cigarette dispenser with new wood top; center is a radio shaped candle; 3rd is a ceramic radio planter. 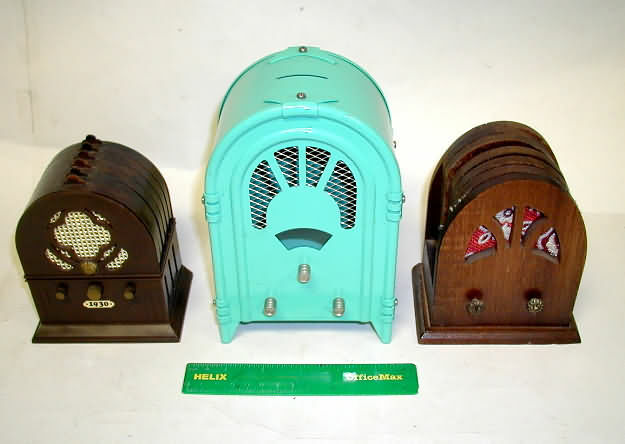 RADIO NOVELTIES: left is a plaster radio bank, center a transistor radio (works but needs new 4 cell battery holder); 3rd is a plaster radio planter. RADIO SOLDIERS: These are WW1 Barclay lead soldiers. I have been collecting these for 35 years so have quite a selection. The first two are repainted and have repro loop antennas; last two all original paint and parts. 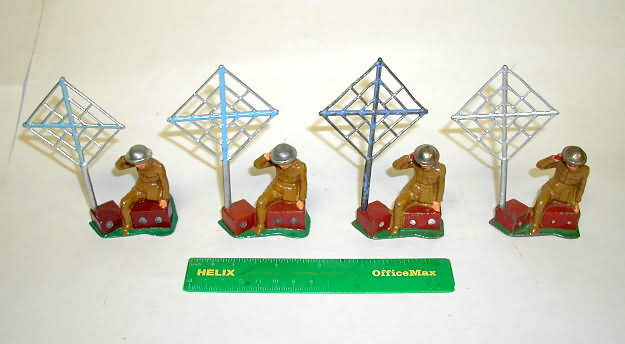 RADIO SOLDIERS: More Barclay lead radio soldiers as described above. This group is in various states of condition. 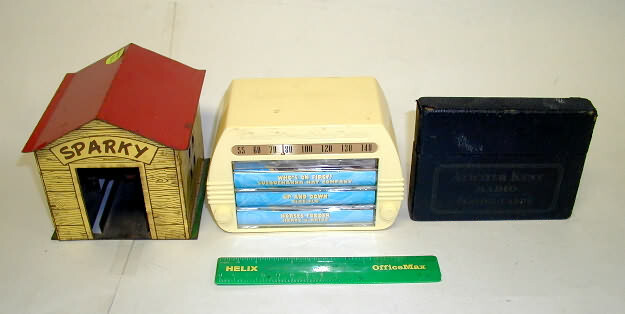 RADIO NOVELTIES: Radio Sparky dog house (tin); 3 casettes in original radio shaped holder; Atwater Kent playing card holder box, dual deck (empty). 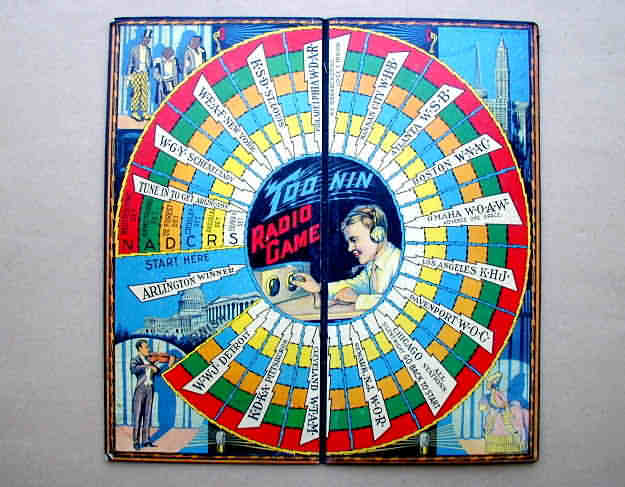 RADIO NOVELTIES: Dual deck of playing cards (no graphics) by Magnavox; framed needle point cathedral radio; ceramic cathedral hangs on wall. 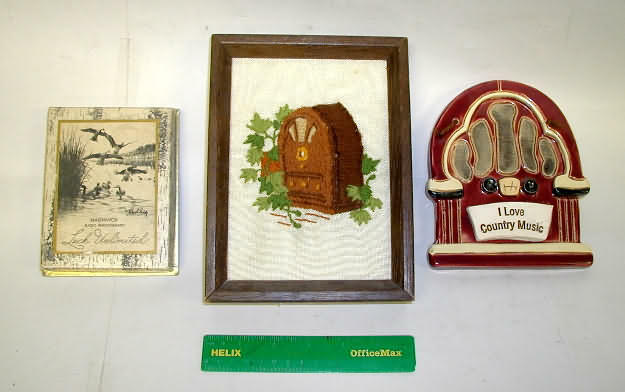 RADIO NOVELTIES: RCA World Wide Wireless desk container - sold; wood souvenir radio banks (Missour and Georgia); celluloid radio log (nice) and Worlds Smallest Receiver (box FR++). 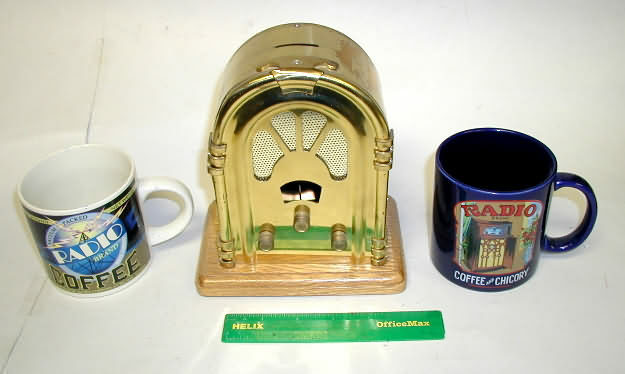 RADIO NOVELTIES: Radio coffee mug (1999); metal cathedral radio bank (some plating showing thru on top); radio chicory coffee mug (scarce 1986). Stock #1739, Price $sold, $sold, $inq. 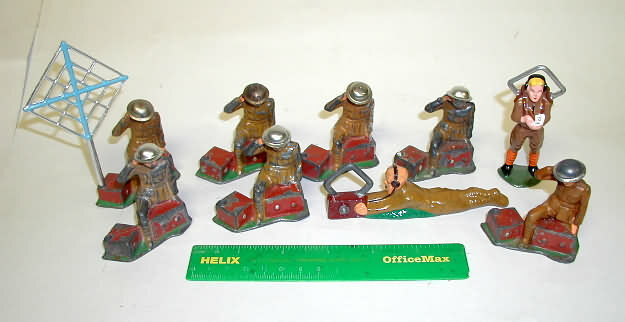 RADIO NOVELTIES: Radio padlocks (left has hard to find key); two sizes of Radio Girl perfume bottles (display use only); two sizes of Radio Flyer miniature toy wagons. 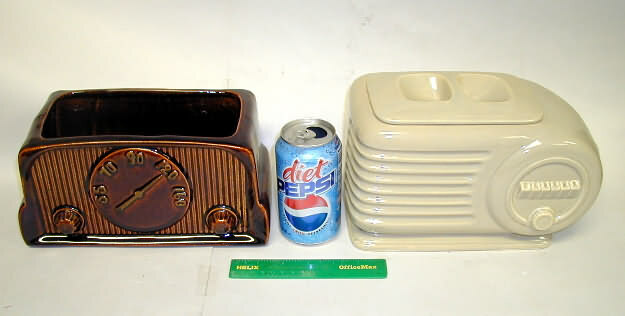 RADIO NOVELTIES: Brown ceramic radio planter and a white table model radio cookie jar - sold. 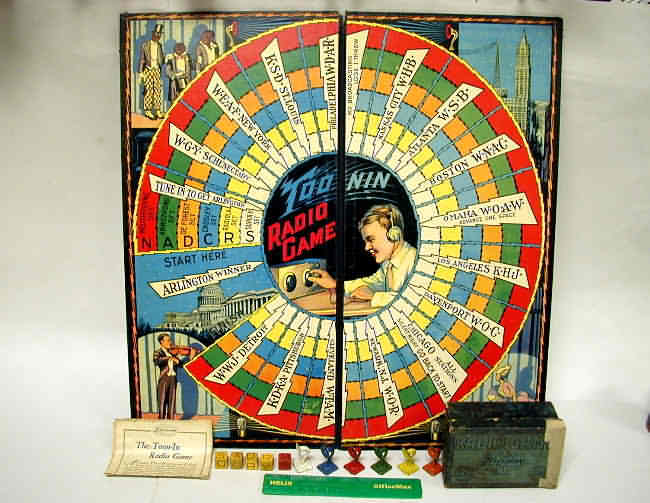 RADIO GAME: Of all the radio games made in the 1920's this one has great graphics. Titled TOON-IN this item is meant to put in a picture frame for display use as it is just the game board. Colors are better than photo shows. 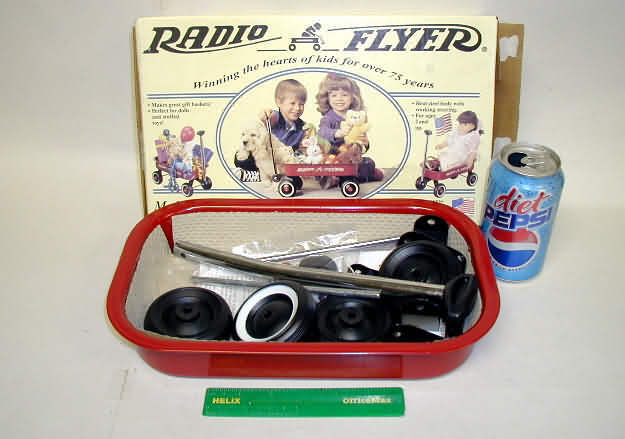 RADIO FLYER WAGON: A new-in-the-box Radio Flyer Wagon. Body size is 12 X 7 inhes and has 3 inch diameter wheels. Assembly required. 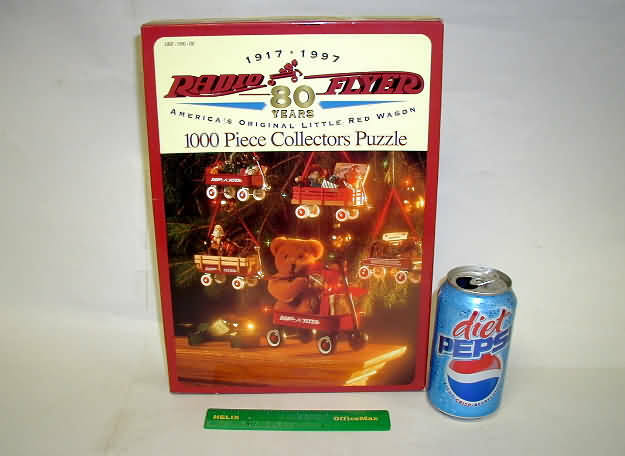 RADIO FLYER PUZZLE: An 1000 piece puzzle of the famous Radio Flyer wagon. It is new in sealed box, from 1997. Size is 51cm x 69cm. 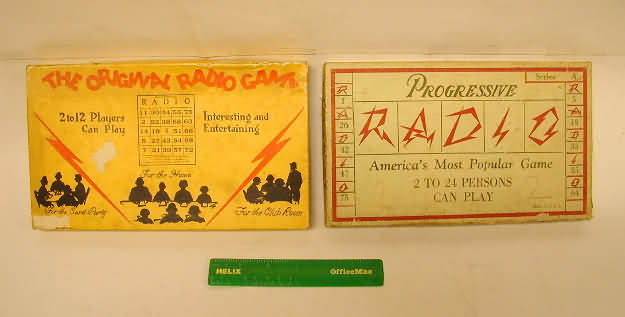 RADIO GAME: The best radio game ever made as far as graphics go, this game is from about 1925. Comes with the hard to find metal horn speaker pieces. The small box has been taped. The condition of board is very good, most that are found are usually fair to good. See #1742 if you just want a game board to frame and hang on wall. 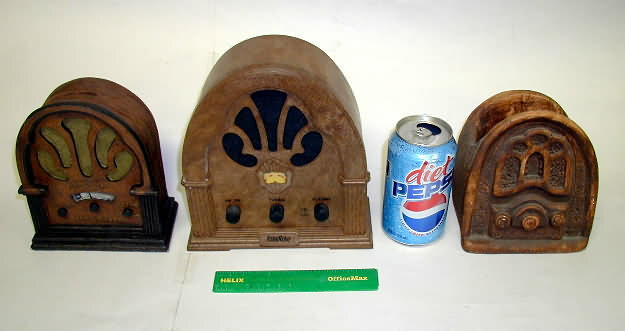 RADIO NOVELTIES: Left is plastic coaster set, center is a cathedral radio bank, right is another coaster set (wood). 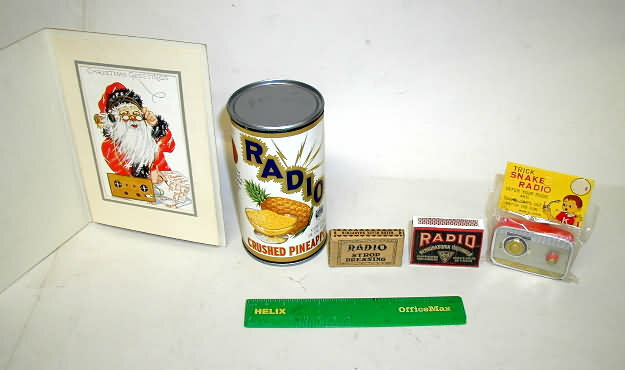 RADIO NOVELTIES: A 1920's original Santa Postcard in display folder; Radio Brand Pineapple label (1932) pasted on a new can; Radio Strop Dressing box; Radio Match label on new box; tin Trick Snake Radio (Japan). RCA INK BLOTTERS: Original unused ink blotters from 1920's by RCA. Three types available, each is in a semi-modern RCA plastic display holder. 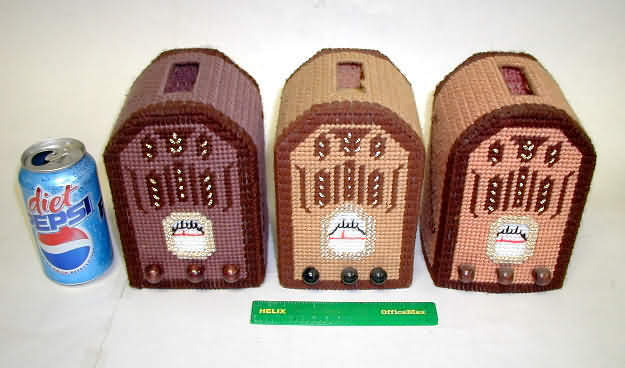 RADIO TISSUE HOLDERS: These cathedral shaped Kleenex tissue holders are hand made with MANY hours spent making them. They take the standard square size tissue box. The 1st one on left is sold. 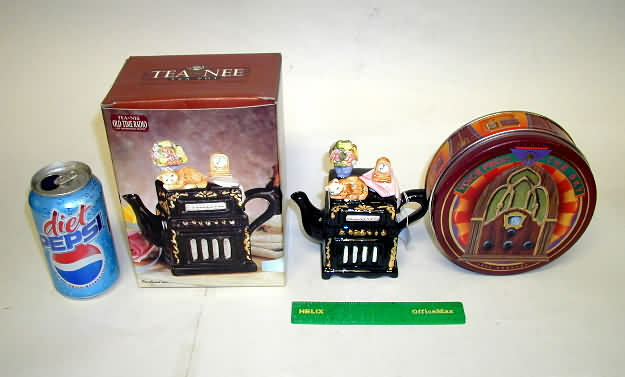 RADIO NOVELTIES: Left is ceramic figurine in original box, it is called Tea Nee radio. Right is around 6 inch tin can showing a cathedral radio. 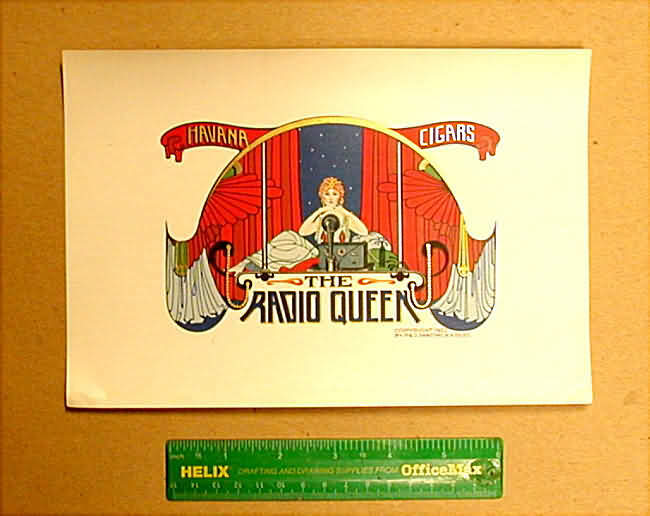 CIGAR LABEL - RADIO: An unused and 100 percent original cigar label from 1922 called the Radio Queen. They look great framed and hung on wall. 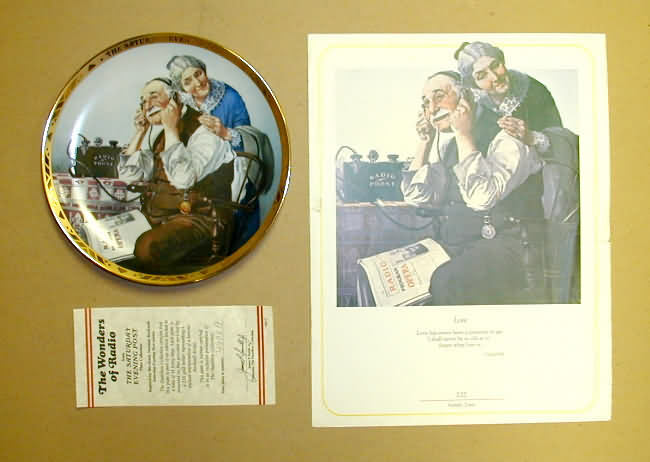 Label size is 6 x 9, they are quite scarce. Colors are better than shown in photo.